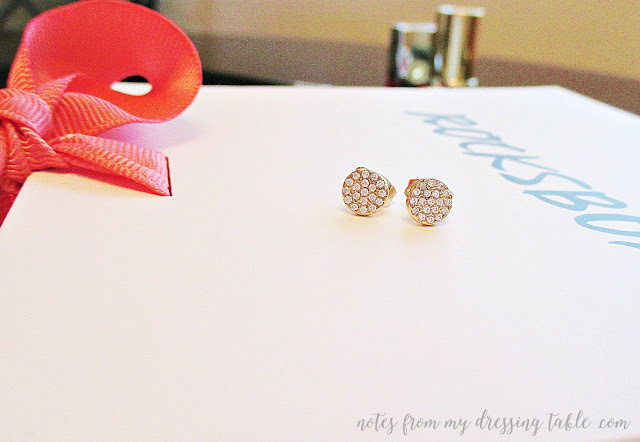 I was recently approached by Rocksbox and offered a complimentary introductory membership giving me the chance to experience the program, try their jewelry and share with my readers my experience with this subscription service. Use my code erikatheicyonexoxo For a free month! First, you sign up. If you choose to use my link I receive an infusion of Shine Spend, dollars I can apply towards future purchases of Rocksbox jewelry. You provide your usual information and preferred payment method then take a quick style quiz and make a wishlist so that the personal stylists can curate your jewelry shipments. Once your account is confirmed and wishlist made, you receive your first month Shine Spend infusion of $10.00 into your account. You are billed $19.00 a month and your first Rocksbox collection is sent your way. You are also supplied with a code that you can share with your friends so that if they sign up using it, like you do, using my link, you receive Shine Spend for each new sign up. And then they can do the same and so on. 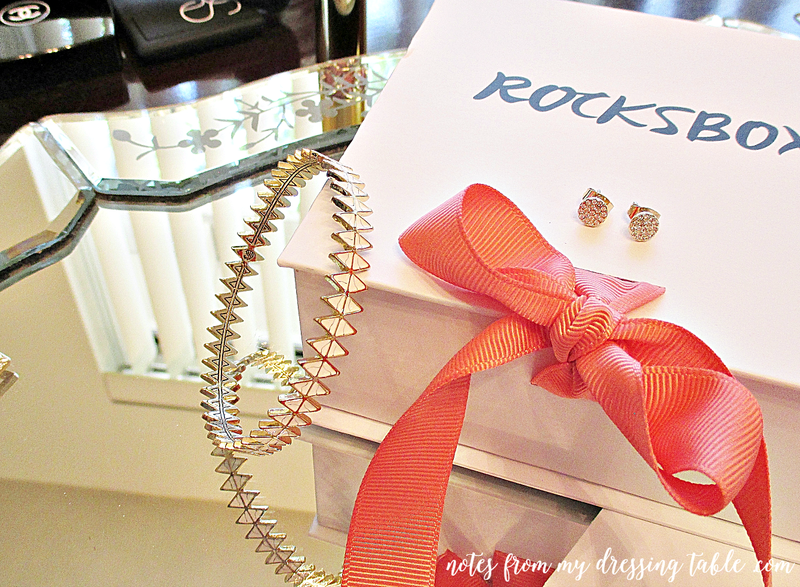 Rocksbox sends to members three piece curated collections that you can try out, wear, think about for a little while. You can decide to keep one or more of the pieces and pay for them on the site, applying any Shine Spend you may have accumulated, if you wish or, package them back up, put the included pre paid shipping label on the mailing envelope and send them back and receive your next collection. You pay no shipping, either way. Once you give quick feedback online on the pieces you received, your next box is curated and sent your way. Would you like to see the pretties in my first Rocksbox? First up there was the Slate Spectrum Necklace. 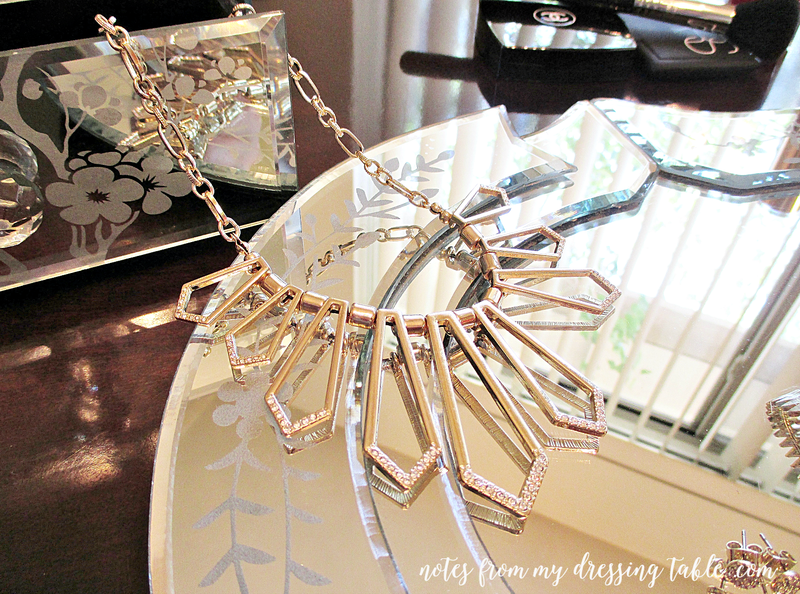 This contemporary piece is a mix of gold tone and inset crystals. Edgy without being over the top, this necklace is weighty, well made and I was seriously tempted me to make it mine. I came thisclose. The Insider Price is $54.00. House of Harlow 1960 Reflector Bangle in White. This lightweight gold tone and white enamel diamond shape bangle is lightweight and comfortable. While pretty, I didn't feel that it was worth the $56.00 Insider Price. And finally we have the simply adorable Sophie Harper Pave Circle Studs. These little gold tone darlings are paved with prong set crystals all over the front and are surprisingly hefty and well made. The Insider Price of $28.00 was pretty reasonable; with my $10.00 in Shine Spend, they were only $18.00 and I snapped them right up! I admit. I was seriously skeptical about this service. "Borrow" jewelry? Return what you don't buy? Weird. I didn't know... Now, I've just received my second shipment and I'm kind of into it. If you are curious, would like to try Rocksbox, yourself, it's easy and fun and you can get as many collections a month as you want, try the pieces, only pay for what you decide to keep and return the rest on their dime. Follow on Twitter and Facebook and stalk them on Instagram. 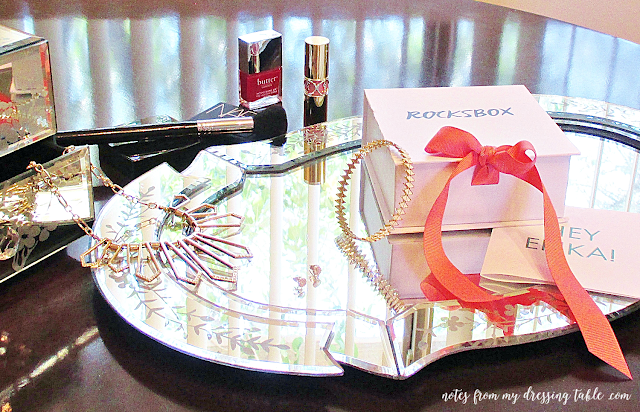 Have you tried Rocksbox? Do you think that you would like to? Please share your thoughts.